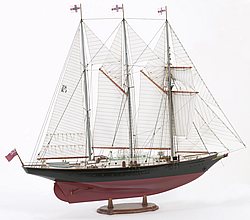 Billings Boats BIL706 Winston Churchill 3-mast schooner 1/75 scale wood ship kit! Three Mastet Topsail Schooner ‘SIR WINSTON CHURCHILL’ The Schooner was built in 1965 at the Richard Dunston Ltd., Shipyard in Hessle, Yorkshire, GB, for the “Sail Training Association” in Bosham. The constructors of this ship were Chamber & Nicholsen Ltd. The ‘Sir Winston Churchill’ is also equiped with a 240 HP help-engine and has a total sailarea of 817 sqm.